Curt Rheingans has been the Superintendent at Creston School since 2017. He received his undergraduate from St. Ambrose University in Davenport, Iowa. His undergraduate had an emphasis in elementary education with an endorsement in reading. Curt taught 5th grade at Calamus/Wheatland and 4th grade at Central DeWitt. He received his Master’s Degree from the University of Iowa in Educational Administration. Curt’s first principal job was at Ed/Co and then went to North Scott to be principal. While at North Scott he also served as the district’s special education director and the director of operations for the district. Outside of education he enjoys spending time with his family. Curt and his wife Carrie have 3 kids. Nathan attends Iowa State, Matthew attends Clarke College and Jacob is a senior in high school. His family enjoys watching sports, traveling, and attending sporting event. 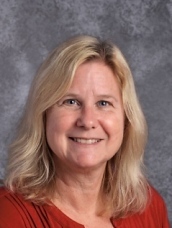 Mrs. Collins is the administrative assistant to the superintendent and has been serving the District since 2002. Previously, she held a medical transcriptionist position and has worked for Caterpillar. She currently lives in Rochelle with her husband and two daughters. It is with great excitement that I greet you as the new Director of Education for Creston CCSD 161. I look forward to getting to know the staff, students, parents, and community. My passion for education has been shaped from my many experiences as an educator. I have been privileged to serve in many different roles from paraprofessional, to classroom teacher, to EL teacher, to ESL/Bilingual Program Specialist. In each of my past roles I always sought to provide for the successes of the students, staff, and school. I enthusiastically embrace the task of continuing to work with all stakeholders to ensure that the students at Creston School are provided with the "keys to success" needed to be productive members of a dynamic society. I believe we will prepare our students for high school, post-secondary education, and/or the workforce by providing differentiated, challenging, and relevant instruction that meets each students learning needs. I look forward to celebrating the continued successes of our students and staff.